​EA Sports is celebrating the birthday of FIFA Ultimate Team today and it just gave its fans a new release of cards. The new release is know as the Birthday Squad, and it comes with three different parts. 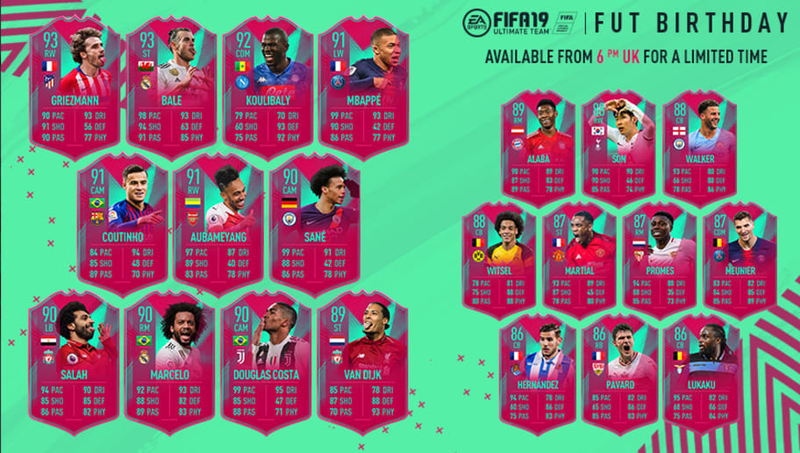 One part has position changes for certain players in packs, another has three players in Objectives today followed by three more next week, and the last has new SBC cards. The main focus of this release is the position change cards, as there are 22 players who received them. Two players who immediately stand out are from Liverpool, Mohamed Salah and Virgil van Dijk, as both players received a kind of ridiculous position change. Salah was repositioned at left back, while van Dijk was moved up to a striker. It's crazy to even think about these two at those positions, so it's going to be interesting how good these cards actually are. Some other notable changes came to Kalidou Koulibaly, who was moved from his centerback position up to center defensive mid, and Marcelo, who was moved from left back to right mid. Those are two premier players who can now be very versatile in your FIFA Ultimate Team lineups and formations. The new SBC cards are awesome as well with a 92 striker David Villa, 91 Timo Werner, and 92 Icon Steven Gerrard. You will have to complete plenty of sets to get these players, but based off their rankings, they should definitely be worth it. Last but not least, there are new Weekly Objective cards as well, which include an 87 left wing Gervinho, 88 center defensive mid Naldo, and an 89 center back Zlatan Ibrahimović, which might be the most interesting card of the group.